Fact: the spring is a geological which would have been known in antiquity and valued as a source of fresh water at the edge of a salt water harbour. The locality has yielded countless finds going back to the Palaeolithic era; in the Iron Age, of course, Hengistbury Head was a trading community of great importance – a causeway across the harbour to the site of the spring is plausible, probable and, some have said, still traceable. A report in 1909 refers to a councillor’s find of the remains of such a causeway leading through the gap in the Double Dykes straight to the site (see map). According to Mudeford-born Mike Andrews, stones from a submerged trackway from the Head to Stanpit Marsh were taken up by Christchurch man B J Tucker (referred to in the Christchurch Times, April 1928) on account of the danger to navigation. A few years ago Jack Hake (also Mudeford-born) found a barbed flint arrowhead in the outlet from which the spring water now pours into the creek. One spring at Stanpit has a medieval fame as a good water and curative agent (a monkish specific for blindness). It is a soft, shallow, wayside well. . . (Horace Dobell MD Medical Aspects of Bournemouth and its Surroundings 1885). Tutton’s Well has been used by the public since time beyond remembrance. . . It possesses such powerful springs that when not actually overflowed by seawater it quickly throws off all contamination and is one of the purest springs in the south of Hampshire. It is mentioned in ancient documents as a mineral well and supposed to possess properties highly beneficial to those afflicted with weak eyes. The water is frequently conveyed away to distant parts of the country for eye-bathing purposes . . . (Christchurch Times Sept 1884). Tutton’s Well. . .has a constant supply of pure water fed by underground springs whose source is far inland under the high hills of the Forest. Its wonderful purity and mineral salts were well-known to the monks of Christchurch; throughout medieval times it was known all over the countryside as a specific for diseases of the eye and water from the well for medicinal purposes was conveyed to towns far inland. (1933 Official Guide to Christchurch). . . .such beautiful, sparkling water close to the sea water and covered by every high tide without its being contaminated by its near vicinity, yet much of it is on a level with the mud banks. . .
Russell Oakley, founder of the first Christchurch Historical Society in the early years of the last century, councillor, antiquarian and author, described the well as the town’s ‘oldest link to antiquity in the neighbourhood’. A freehold estate situated at Stanpit, fronting the road near Rushford Common, comprising house . . . a plot of land on the west side of the road fronting the above premises bounded by the water with a mineral spring in the centre of the plot. There was no piped water until the West Hants Water Company laid it on, most houses having their own well, and the cottages at Stanpit drawing their water from the far-famed Tutton’s Well. By the side of the road is an open well, called Tutton’s Well, which, although occasionally overflowed during high tides, nevertheless produces a constant and never-failing stream of water of uncommon purity and transparency, believed to be endowed also with many medicinal virtues and held in estimation and veneration by the old inhabitants almost equal to that entertained by the Cambro-Britons for the holy well of St Winnifred. A manuscript reference to the well, undated but a reference to a shop places it as late Victorian, is attached, and describes the well as always being in an open piece of land, pure and free to all users, the volume of which had been calculated in about 1810 as sufficient to supply the whole of our town This is yet another indirect confirmation of the well being in use nearly 200 years ago. In 1859 by public subscription the spring was enclosed by a well structure to prevent contamination, a drinking trough for cattle provided and a raised gravel walk laid to render the well approachable during high tide (Local History Room contemporary document). An inhabitant born in 1883 (H C Hyde, quoted in the Christchurch Times, 16 December 1958) recalled two paths leading from the road to the well which was located almost in the middle of the land; its shaft was 2′ in diameter and over the well was a roller supported on two timbers with a bucket on a chain ; which was wound up and down on a crank handle; over the roller was a timber roof.’ So, there was at some stage a traditional well before the pump replaced it. In 1887 a public meeting was held in Stanpit to discuss the well. It was related there that the town’s former [in]famous MP, Sir George Rose, had bought the land it is sited in and his grandson, Sir William Rose, wished to give a free grant of the land to the inhabitants for use as a public water supply. All he requested was a memorial plaque on the site to his father. Sir William died in 1885 and no deed was ever drawn up, but Christchurch Council resolved (April 1887) to accept the gift of the land, to maintain it and keep in order the well as a public water supply. The council subsequently raised the level of the ground with road sweepings and other debris. n 1899 Sir George Mivart reported on the town’s (inadequate) water supply, described Tutton’s Well as being in an open grassy space sloping down to the creek, and the mouth of the well as being 45′ above high water mark, constructed of 3′ concrete cylinders; adjacent to it was a dipping place ‘surrounded by a raised border of ornamental masonry work surmounted by a railing’. He further remarked that he was not sure how the dipping place was fed, but supposed it to be kept supplied ‘from the troughing beneath the pump’.. By 1903 a pump had been installed (Christchurch Times 25 Apr 1933), but this earlier reference suggests one was there before that date. It is not all superstitious imagination: the water, by reason of its great purity is distinctly beneficial for a good many ailments, but . . . full of dead dogs, tins and paper. Another councillor said: ‘I’ve sampled the water, and it is actually wonderfully refreshing.’ The newspaper report also featured a move by the town’s pre-eminent antiquarian, Herbert Druitt, for the well to be listed as an ancient monument. In 1937, the well was reopened, after repeated requests from Mudeford residents (Christchurch Times 16 Oct 1937) after a satisfactory test. The pump was replaced by a replica wellhead structure. A decade or two back, old Mr Stride told me as a boy he used to row a small boat up to the grass edge and fill up buckets of water and row them back to his cottage so that his grandmother could do the Monday’s laundry. 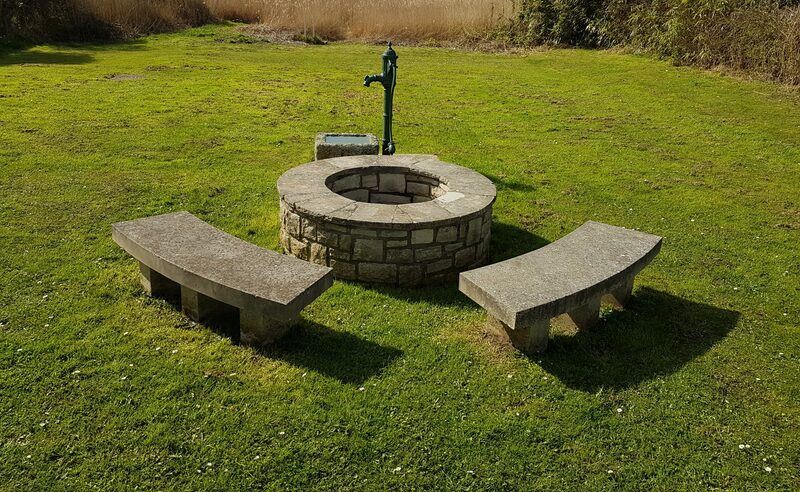 The well was associated with the age-old fishing industry, being a well-attested site for drawing up the boats for repair and the nets laid out to dry. This is frequently recorded in living memory and a 1960 photograph illustrates this use. Because of this facility, a stone dock was laid alongside the creek with a slipway leading down to it. Local man Les Edgell remembered it as stone-built and running at right-angles to where the spring water flows out through the pipe. Facing the marsh, on the left of the slipway a large lagoon in front of the little quay wall was capable of taking boats of over 20′. The depth of the lagoon was about 3′. This lagoon and the channel were kept open and free of silt by a stream which flowed across the marsh from Purewell. This stream was diverted when Stanpit Marsh was used as a tip in the early decades of the 20th century. The land around the well and spring was called, according to the deeds of Tutton’s Lodge adjacent, Tutton’s Well Green in 1870 and ‘Tutton’s Public Well’ by 1891.